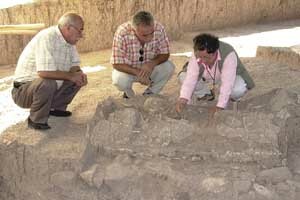 Aslihan Yener (above, right) inspects a burial site at Tell Atchana, the ancient Bronze Age capital, Alalakh, which is located in the Amuq region in southern Turkey. Yener and a team of Oriental Institute archaeologists, including David Schloen, Associate Professor in the Oriental Institute, recovered artifacts at this site, which included the burial of four humans. Unlike any other tomb discovered in the Middle East, this burial consisted of a plaster-arched structure on a cobblestone foundation. Clay tile headstones were stacked four high in two columns, explained Yener, and a level of plaster separated each person from the other. 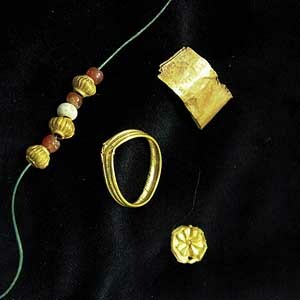 Fine jewelry, including the gold pieces shown above, were found buried with the individuals in the tomb. Vessels, similar to the one pictured above, also were found buried in the tomb. Inundations and other natural disasters usually spell the end for important archaeological projects, but in a rare example of a fortuitous flood, the Oriental Institute is recovering important additional artifacts from a site abandoned 55 years ago in Turkey. Famed British archaeologist Sir Leonard Woolley was the first to excavate the site of Tell Atchana, the ancient Bronze Age capital, Alalakh, which is located in the Amuq region. Because this area in southern Turkey was at the crossroads of many of the ancient Near East’s important civilizations, the Amuq Valley is an extremely rich source of archaeological information. “Woolley’s excavation trenches collapsed as a result of massive flooding of a nearby river, the Orontes, in 2001, and the site was flooded again in 2003,” said Aslihan Yener, Associate Professor in the Oriental Institute and Director of the new excavations at Alalakh, an effort to re-establish the Oriental Institute’s work in the region, which began there before World War II. But the flooding also revealed a Bronze Age wall, and salvage work enabled access to a long-forgotten storeroom collection of artifacts that became accessible for the first time in decades. During the fall, the team re-excavated the site, dated circa 2000 to 1200 B.C., revealing an area that had once been the west wing of a Hittite period palace and private houses. With David Schloen, Associate Professor in the Oriental Institute, Amir Sumaka’I-Fink of Tel Aviv University and graduate students in Near Eastern Languages & Civilizations, the team recovered the artifacts, placed them in a museum and recorded them. Those ancient items, including cuneiform texts, spoke of a rich system of trade connecting the community with Anatolia (Ancient Turkey), the Aegean Sea, the Baltic Sea, Egypt and the Indus valley in India. Also important to the team was a tomb, dating from about the 14th or 15th century B.C., apparently one of several at the site. The tomb was formed unlike any other excavated in the Middle East. “This special burial consisted of a plaster-arched structure on a cobblestone foundation,” Yener said. “Two columns of clay tile headstones were stacked four high.” The people buried in the tomb may have been originally placed in wooden coffins. The tomb included four people, each separated from the other by a level of plaster. There also were many appliqués with a rosette design that were probably sewn on garments or an elaborate headdress. The remains of one individual, identified as “individual three,” had plaster in the mouth and lay in a flexed position. At each corner of this person’s grave was the leg bone of a cow, numerous bird bones, seeds and what appeared to be dried fruit. The person also was buried with pottery vessels, including flasks that would have contained beer or wine to provide sustenance for the afterlife. Additional remains, identified as “individual four,” were wrapped in clothing fastened with a silver pin, and gold rings were positioned on either side of the skull. “The results of our excavations have compelling implications for other regions of the eastern Mediterranean,” Yener said. The material will help scholars understand the transition of regional states to empires, such as the Hittite empire, and then their disintegration into small, local Iron Age kingdoms. The work at the site, which includes excavation of a palace and such finds as cuneiform tablets and seals, will help scholars explore kinship systems as well as the system of production and exchange that underlay the achievements of local craftsmen and those engaged in specialized manufacturing, Yener said. Work at the excavation site also will help determine the role of private entrepreneurs as opposed to royal officials in commerce. By exploring a palace location, the researchers hope to determine if the craftsmen and merchants were attached socially and economically to the palace or if they were part-time farmers. The Amuq Valley Regional Projects began in 1995. Through its survey work, researchers have examined 346 sites, some of which were explored using advanced remote sensing techniques such as Geographical Information Systems. Three sites, Tell Kurdu, Tell Atchana and Tell Tayinat, have since been under excavation. The Oriental Institute’s founding Director James Henry Breasted inspired a team of archaeologists to go to the Amuq region, including the late Oriental Institute archaeologist Robert Braidwood, who also did important work in the area. University researchers surveyed the region and excavated six sites between 1932 and 1938.